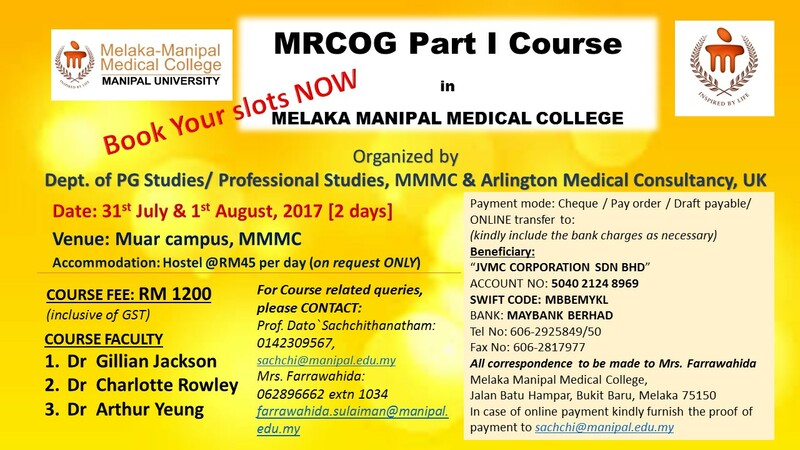 We the Post Graduate Department, MMMC in collaboration with the Arlington Medical Consultancy, United Kingdom is keen to promote the PART1 MRCOG course for all potential Malaysians. ABM Academy (ABMA) which is the education arm of Arlington Medical Consultancy has held courses in India/Sudan & UAE since 2010. In this context, The PART 1 MRCOG course will run over a period of 2 days from 31st July to 1st August. The venue will be at the Muar Campus, MMMC. Please pass this information to all those far and near who may benefit from the abovementioned course. THE CLOSING DATE IS ONE MONTH BEFORE THE STARTING OF THE COURSE!! !